Traditional Billboard Advertising in Las Vegas. Static billboards are a more traditional form of outdoor advertising. 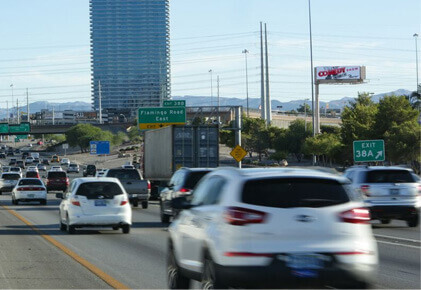 With Las Vegas Billboards, you’ll easily reach your audience and communicate your goals to them. Everyone travels the roads in the area, so our billboards are located along major roadways. Since we have prime billboard locations throughout the Las Vegas area, both locals and tourists will see and learn about your company. When you work with us, you have the freedom to choose the contract time to advertise. Most of our clients choose to advertise for a year or longer. However, you can choose to advertise for as short as a month. Our customers are always satisfied with the amount of traffic they’re able to reach from our billboard locations.